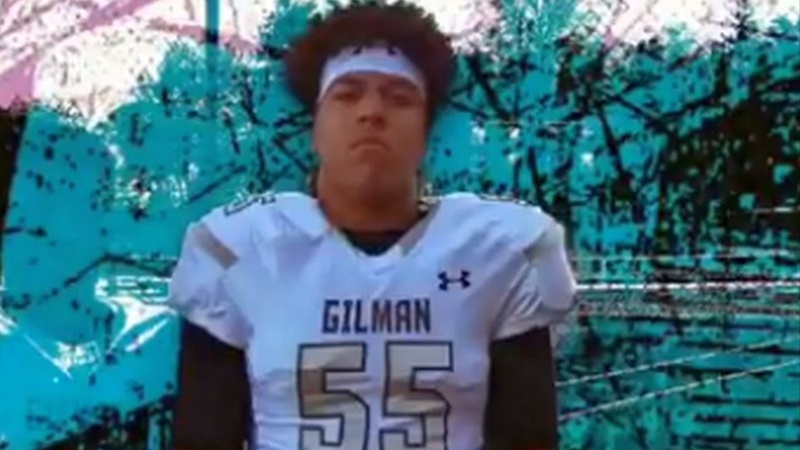 Shirts With Random Triangles: Three-star OT prospect Zachary Franks flips 2019 commitment from Penn State to Northwestern. Three-star OT prospect Zachary Franks flips 2019 commitment from Penn State to Northwestern. Zachary Franks. Image via Bear Insider. Time for another edition of “He’s Just Not That Into You." Baltimore, Maryland high school senior offensive tackle Zachary Franks has announced he is flipping his commitment from Penn State to Northwestern’s 2019 football recruiting class. 247Sports grades Franks as a composite three-star offensive tackle prospect. The recruiting site’s composite prospect rankings for 2019 rank Franks at no. 86 among OT Prospects, at no. 16 among prospects from the state of Maryland, and at no. 881 nationally. Franks attends Gilman High School in Baltimore, Md. He stands 6’5, and weighs 284 lbs. The adjusted numbers for Northwerstern and Penn State’s 2019 recruiting class sizes have both schools with fifteeen commitments each.